At the Dolphins day Nursery we arrange two family outings a year. These have included locations such as Tilgate Park, Fisher's Farm and Local Theatres. The aim of the day is for us all to share a day with our families, an opportunity for you to see us with our own little treasures. These days are a very relaxed affair and gives us all the opportunity to get to know each other a little better, not just when everyone is in a rush. Toilet Training is always an exciting time! After all, progress is always great. It is worth remembering that different children achieve toilet success at different ages, no two children are the same. Your child does NOT NEED to be toilet trained before attending Dolphins Day Nursery. Please feel free to discuss your child's progress and any anxieties you may have. We will try to follow as closer a toileting routine as you as possible. Just remember when training starts please ensure that we have enough spare trousers/pants and socks to last through the day. It is of paramount importance to this nursery that all children in the nursery should be treated with great care and consideration. 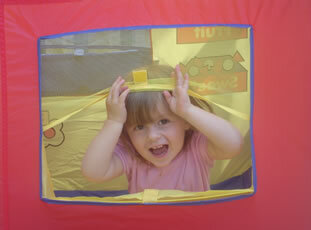 A new child should feel comfortable, cared for and integrated into the life of the nursery as quickly as is possible. When your place has been registered at he nursery, we will contact you prior to your child starting nursery and arrange a time when you can visit the nursery with your child. This visit gives us all the opportunity to share information about your child and the nursery. You are welsome to ask any questions regarding the nursery, staff, routines and activities. Your child's team leader will need to ask questions about your child and his/her needs, likes and dislikes. You are invited to leave your child for two short visits (usually two hours) during the week prior to your child's commencement to ensure that he/she settles into nursery as soon as he/she starts (no charge is made for this).